We had reported earlier about the rumor going around that iPad 2, the next generation of the iPad will be out by December. More speculation today as it is being reported that the second generation iPad is expected land around April time in 2011, about the same time the iPad was released this year. Speculations about its configuration and its features are already being talked about and it is being said that the iPad2 will be having the FaceTime feature that lets users video conference with others. It is being said that Apple wants to push FaceTime in big way and working on updating its iOS 4.2 to support the feature. 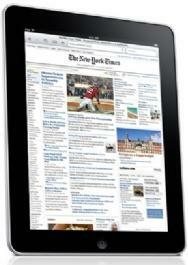 The iOS 4.2 for iPad’s would be launched in November. The second generation iPad is rumored to include front and back facing cameras like the iPhone 4. Due to addition of cameras the iPad is expected to also get more RAM to support newer features. A higher resolution display is also being added to the second generation iPad. iPad first generation users will not be disappointed as Apple is rumored to be working on getting external cameras for FaceTime calls. There is no confirmed report over how true any of these rumors will be however a lot will be revealed looking at the iOS 4.2 and the new features that it will support which may very well reflect on the possible features of the iPad 2.